How I Edit the Kitchen - edit spaces. A few years ago when I told others about my organizing business the automatic assumption was I spent my time on closets, closets and more closets. And they weren't wrong! But since moving my business to Austin a fun shift has taken place - organization know-how has swept the nation (as it should!) and now my clients want all the puzzles in their home solved. And this puzzle solving usually begins with the heart of the home - the kitchen. Yay! A gloriously set up pantry and kitchen is just so gratifying - not to mention the quickest way to create order within the rest of the house. Our kitchens are central command so having this area solved and set up correctly allows for efficient meal times, calmer mornings and savings! Yes, savings...when you can clearly see all of your dry goods, spices and kitchen gadgets you won't continue to repeat buy oregano, mustard and pasta...just the tip of the iceberg. With this shift, and after years of organizing countless kitchens of all sizes, I have my plan down pat. Follow along! 1. MEASURE. This is the step we all dread and many skip but you have to do it. No need to be obsessive but make sure and get the width, length and depth of each cabinet, drawer and pantry shelves. I like to sketch out a super basic kitchen set up and fill in the measurements on this drawing. Pro tip - Make sure and note if shelves are on pegs and moveable...and when measuring interior cabinet depth take the hinges into account. 2. Buy any needed supplies using the measurements you just took. The endless organizing supplies out there can be overwhelming so don't let this step trip you up. That said, it's completely fine to only work with what you have and skip supply buying. If this is you then skip ahead to step 3 :) But if you think you need some assistance then here are the main candidates to consider...clear bins, drawer dividers, a great cutlery organizer and turntables. That said, kitchen and pantry supplies are a whole post unto themselves so stay tuned...next week I promise! 5. Take a deep breath...if you have made it this far the hardest part is over...way to go! 6. Start putting things back one at a time, using any supplies you have deemed necessary for your space. I always start with drawers - placing cutlery first (as close to the dishwasher as possible) then serving utensils and finally all small gadgets (peelers, garlic press, whisks). With this base organized you will know what drawer space remains. In a perfect world I try and also devote one whole drawer to each of the following...spices (I'm a spice drawer convert), hot pads and trivets, dish towels and plastic wrap/foil/ziplocs. Then from there tackle upper cabinets, lower cabinets, open shelves and finally your pantry. Some items will end up where they were before but most likely you'll find new and better solutions within your space. Pro tip - Vertical spaces should hold vertical items and horizontal spaces should hold horizontal pieces. 7. 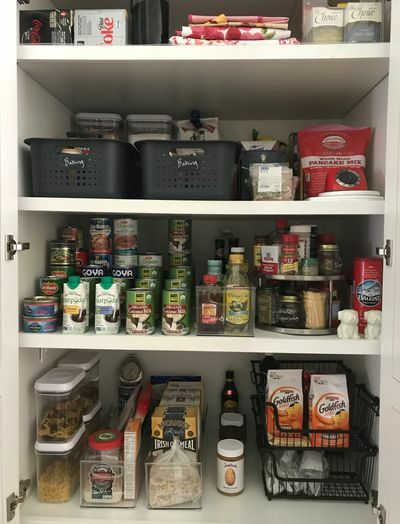 A word on the pantry...I swear by clear bins as a way to group like items, create rows in your space and limit consumption. My most used bin categories are dried fruit & nuts, breakfast, pasta & grains, baking (usually needs 1-2 larger bins) snacks and caffeine. 8. Label as needed! Chalkboard pens can be used to write directly on your plastic bins, risers and turntables or you can use adhesive chalkboard labels. Either way the writing can be wiped off with a damp paper towel and redone as needed! 9. Take stock! Make notes of any spices that need replacing, oils and vinegars that need lazy susan-ing (technical term) or drawers that need further dividing.